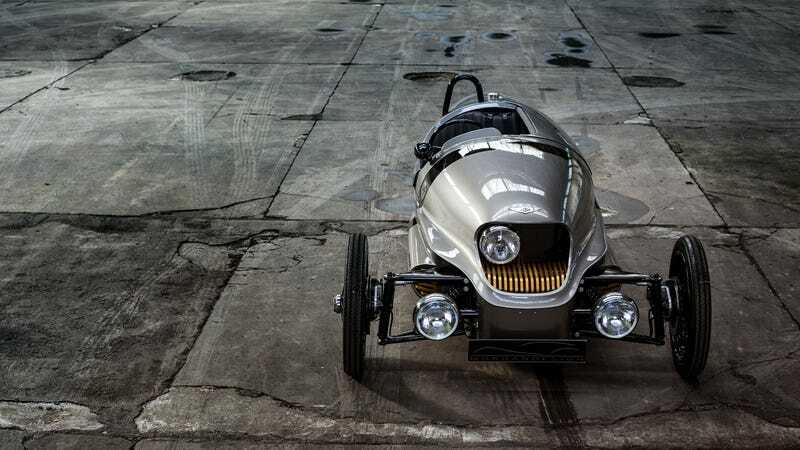 At the 2016 Geneva Motor Show, the electric Morgan 3-Wheeler, dubbed the EV3, captured our hearts. Unfortunately, there were some production changes along the way, but those are all settled up now and the company back on track with building the EV3. Fun. Morgan was supposed to put the EV3 into production in late 2016, but was set back when the company decided to source its powertrain from another supplier. It was able to sign an agreement with Frazer-Nash, the company behind the Metrocab, London’s first all-electric taxi. The EV3 will now have a 120-mile range via a 21 kWh lithium-ion battery and a liquid-cooled 46.5-horsepower (56 maximum) Frazer-Nash A010229 motor for the rear wheel, the company said in a press release. The Morgan 3-wheeler is actually the ideal car for such a setup. Sure, a 120-mile range and 56 HP might not sound like a lot, but most sane people probably won’t be embarking on massive road trips in their Morgans. Plus, the 3-Wheeler is light as hell. Momentum is momentum. I love this thing, it’s like it’s from the future of 1930. Can you imagine bombing around in a 3-Wheeler—only it’s silent and with instantaneous torque? That’d be rad as hell. EV3 production will start in late 2018 at the Morgan Pickersleigh Road factory. They better send them here.